You can discard 1 other “Mayakashi” monster; Special Summon this card from your hand. 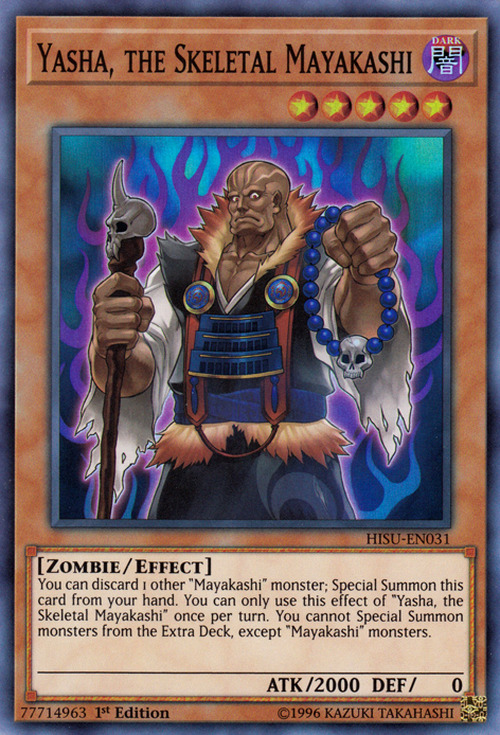 You can only use this effect of “Yasha, the Skeletal Mayakashi” once per turn. You cannot Special Summon monsters from the Extra Deck, except “Mayakashi” monsters. Yasha, or yaksha, is a type of spirit in Buddhism and Hinduism. This monster is depicted as a Buddhist monk who's holding the Buddhist equivalent of a rosary. Gashadokuro, the Skeletal Mayakashi is the Synchro counterpart of this card.